George Carl Raupp. Courtesy of Raupp Memorial Museum, Buffalo Grove, Illinois. [S11] John J. Weidner, Compiled Birth, Death, 408. [S7] St. Mary Catholic Church, St. Mary's School Dedication, 154. [S93] Arlington Heights Herald, 24 Dec 1943, sect. 1, p. 2, col. 3. [S148] Arlington Heights Herald, 20 Jan 1955, sect. 1, p. 5, col. 3. [S522] Letter, Robert F. "Buzz" Weidner to John J. Weidner, ca. 1992. 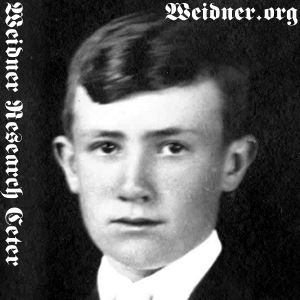 [S11] John J. Weidner, Compiled Birth, Death, 408 date only. [S151] Arlington Heights Herald, 12 Feb 1953, p. 15, col. 3, date and location. [S522] Letter, Robert F. "Buzz" Weidner to John J. Weidner, ca. 1992, no marriage date or location. [S239] Daily Herald, 29 Jun 1998, sect. 4, p. 6, col. 6.